Wouldn’t you love a daily spa experience? Lush bathrobes. Soothing music. And some body pampering? The truth is that there is a lot of GOOD that comes from some spa experiences. It’s a lovely way to “thank” your body. But of course, going to the spa on a regular basis is not only expensive, but you never know if the products used are really safe for your body. Good news! 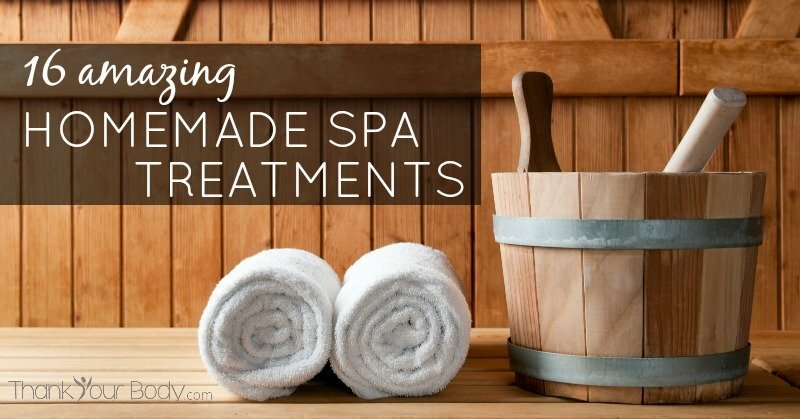 Creating your own spa-like experience is super easy, luxurious, and healthy with these 16 Amazing homemade spa treatments. 2. Drink a glass of refreshing lemon water. Many spa treatments focus on gentle detox practices. Starting your experience with some lemon water is a simple way to give your body a little boost. Plus, it’s always wise to stay hydrated. 3. Take five deep cleansing breaths. Take a deep breath in, allowing your abdominal to expand gently. Hold it for a moment or two before exhaling. Repeat 5 times. This will lower your blood pressure, relax your muscles, tune your mind inward, and prepare you for the goodness to come. 4. Add some mood music. Pick something that will calm your senses and help you enjoy the pampering. These 16 homemade spa treatments are simple and non-toxic. Choose a handful to do on a lazy afternoon, before bed, or whenever.